Interceptions are not the issue, but are merely a symptom of the issues hampering Bradford’s game; can they be fixed? The last two weeks of the Eagles season perfectly illustrates the importance of the quarterback position. The Eagles have gone from 1-3 with their season on the brink of collapse, to being in first place in the NFC East. They have been led by a dominating defense and strong play from their offensive line and run game, three things which seemed inconceivable after the loss to the Atlanta Falcons. And they have won their last two games by a combined 44 points while piling up 957 yards of total offense in the process. Heck, even their much maligned kicker, Calib Sturgis, has been perfect on field goal attempts over the last two weeks. Given what we have seen, it is fair to wonder whether this is the deepest and most balanced team that Chip Kelly has had as head coach of the Eagles. And yet, there is an overwhelming sense of anxiety surrounding this team. Why? Because of the quarterback. To put it mildly, Sam Bradford’s play has been inconsistent. Ask anyone the biggest problem with Bradford’s play to date, and they will likely point to the alarming rate at which he is throwing interceptions. And indeed, Bradford’s 3.9% interception rate dwarfs his career rate of 2.2%. His nine interceptions rank second in the NFL, and his four redzone interceptions — three of which that have occurred in the last two weeks — is tops in the league. Bradford is one of only two quarterbacks to throw two-plus interceptions in four of the six games he’s played (the other being Kirk Cousins). But the interceptions are not the reason for Bradford’s poor play, they are merely the symptoms of the actual flaws in Bradford’s game that are causing the interceptions. Bradford’s ball placement has been inconsistent, which largely results from his failure to transfer his weight during his throws. Bradford [has been] tentative in the pocket, not mentally sharp, and at times he did not let it loose when he had a throw. An inconsistent profile had been established. What really stood out as the year [has progressed is] Bradford’s reaction to pressure — the issue that first surfaced in his rookie season against Kansas City. It is easy to place the blame on the…poor pass protection, but that circumvents the more essential point. You must be able to function effectively in a muddied and noisy pocket to play quarterback well in the NFL, and Bradford began to perceive pressure that was not there. He was anticipating the rush, and you cannot perform that way, no matter what kind of talent you have throwing the football. I think this is a fairly accurate depiction of Bradford’s struggles so far this year, with the exception that Bradford has been willing to take more shots down the field as the season has progressed. The only problem? Cosell wrote this back in 2012, after Bradford’s second year in the league. I slightly modified the post so that it was in present tense. Which begs the question: if Bradford is struggling with many of the same issues that limited his game over four years ago, is it reasonable to expect him to improve this year, even if he cuts back on the interceptions? Or, to steal a line from Denny Green, is Sam Bradford what we thought he was? The answer, as usual, is a mixed bag. When we dig deeper into the numbers and the tape, a picture begins to emerge of an incredibly talented, but flawed quarterback; one that should expect to see areas of improvement as the season progresses, but one who likely won’t live up to the lofty expectations that most fans had during the preseason. Let’s break this down further. *Note that the number of candidates vary from year to year because a different number of candidates qualified for PFF.com’s statistics. **In 2013, I used only the numbers for the first seven weeks, since that is the time period Bradford played before suffering a torn-acl. Now, pressure impacts every quarterback. Even Aaron Rodgers and Tom Brady throw bad interceptions under pressure. That is why pass rushers are, on average, the third highest paid position group in the league (behind only quarterbacks and wide receivers). So throwing interceptions under pressure is not unique to Bradford. While Bradford has thrown the third most interceptions while under pressure this season, there is some evidence to suggest that he will cut back on the interceptions. In Bradford’s rookie year, he threw 7 interceptions, which was tied for fifth most in the league. That’s to be expected for a rookie quarterback. But in each of the following three seasons, Bradford showed marked improvement protecting the football. Bradford’s struggles this year might be the result of his time away from the game. With time, we should expect to see Bradford improve as he get more comfortable with this offense and more confident in his knee. But that does not necessarily mean that Bradford’s problems throwing under pressure will be solved once he cuts back on the interceptions. Bradford’s completion percentage under pressure has ranked towards the bottom of the NFL throughout his career, which suggests a deeper issue that cannot be explained away by the rust caused by his time away from the game. For whatever reason, Bradford struggles when he does not have a clean pocket. This struggle is one of the primary reasons why Bradford is such a frustrating quarterback to watch. In training camp and preseason — when pressure is virtually nonexistent — Bradford’s pinpoint accuracy and quick decision making are on full display. But when the pressure comes, Bradford freezes up. His mechanics become sloppy, he gets rid of the ball too quickly, and he becomes wildly inaccurate. Five seasons in, it is reasonable to wonder if this is an issue that will persist for Bradford throughout his career. To understand the importance of not transferring weight on your throw, we need to understand the technical components of throwing the football. Many exercise scientists and kinesiologists agree that that throwing a football at an elite level is the most complex motor skill in all of sports. It requires flawlessly executing a number of independent, but related moves in one compact throwing motion. Even the slightest breakdown in mechanics can adversely affect a quarterbacks power and accuracy. A quarterback needs to put approximately 70% of his weight on his back plant leg plant his back leg. The quarterback then turns his front shoulder inward and away from his target, like loading a spring. In one fluid motion, the quarterback uncoils the spring, exploding forward with his throwing arm rotating towards the target while transferring his weight from his back leg to the front leg. Many people mistakenly believe that power is generated from a quarterback’s arm, when in fact, it comes primarily from the quaterback’s core, legs and hips. It is generated in that last motion, with the quarterback rotating his hips and transferring weight from his plant leg to his front leg. But the key is to allow that weight transfer to occur naturally. If you rush or force the weight transfer to your front plant leg too early, it creates an all arm throw that lacks velocity and consistent accuracy. That’s what happened to Drew Brees last year when he was dealing with an oblique injury, and we are seeing it with Bradford this season as well as he continues to come back from his knee injury. The position of Bradford’s shoulders tells us that he is not transferring his weight properly. 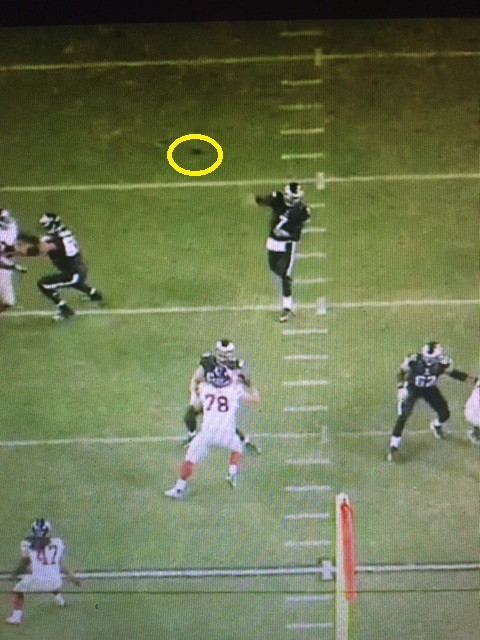 With proper mechanics, Bradford should have rotated his throwing shoulder towards his intended target, Ertz (which would be towards the bottom left of this picture). Instead, we see that when Bradford releases the ball, his shoulders are practically parallel to one another; there is virtually no rotation towards his receiver, which explains why the throw came up short. The question is whether Bradford can fix it. Jaws thinks the issue stems from a lack of confidence in his knee, which wouldn’t be the first time a quarterback has struggled with his mechanics when coming back from a knee injury. Robert Griffing, III had the same issues following his knee injury in 2013. These are clear signs that Bradford is not transferring his weight properly in his throw. Now it’s just up to him to fix it. The final issue I’ve noticed on tape has been Bradford’s poor decision making. While Bradford is known for his high football intelligence, he has curiously struggled to work through his progressions and see open receivers this season. We have seen this issue pop up throughout the season (which I have covered here and here). Let’s start with his interception to Riley Cooper against the New York Giants. When I first saw this live, I thought the interception was on Cooper, who stopped short of his route. But watching the tape again, I saw why Cooper optioned to a deep curl instead of the post: there was safety help over the top. Here is a screen shot right at the moment Bradford was releasing the ball. 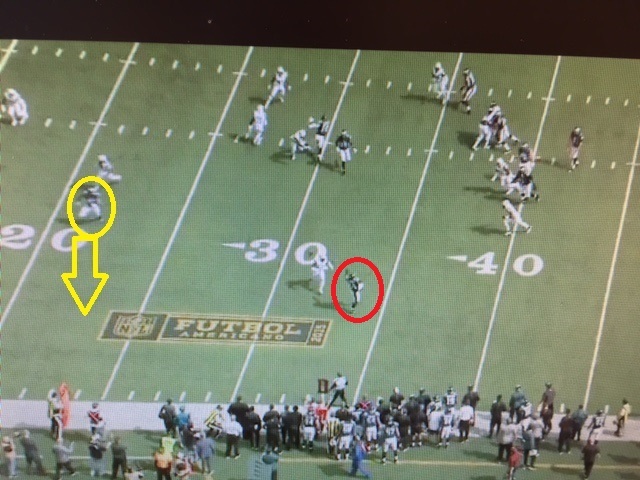 Cooper is highlighted in yellow and is starting to break into the curl route. 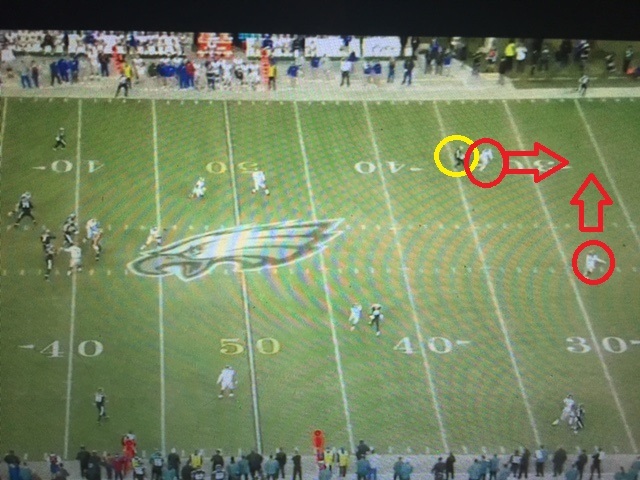 The safety (highlighted in red at the center of the field), is already breaking on the post route. Cooper made the right read here. Running a deep post into double coverage, especially with someone as slow as Cooper, is a recipe for disaster. Cooper recognized this, and optioned to a deep curl in single coverage. But Bradford threw to the deep post anyway. He just can’t make this throw. Bradford has struggled making correct reads and getting through his progressions throughout the year. 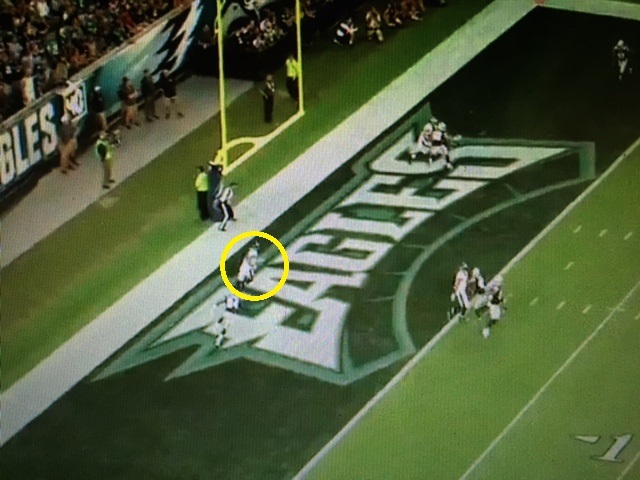 Consider this first and 10 play in the first quarter of the Eagles game against the New York Jets. 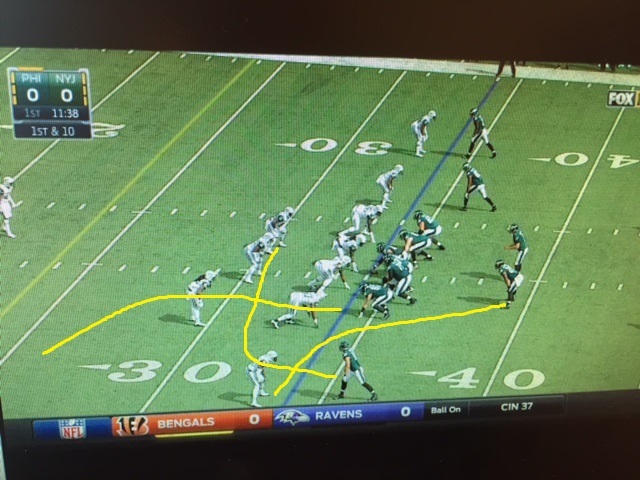 The Eagles are running a staple of Chip Kelly’s offense, the triangle concept (which I cover in depth here). 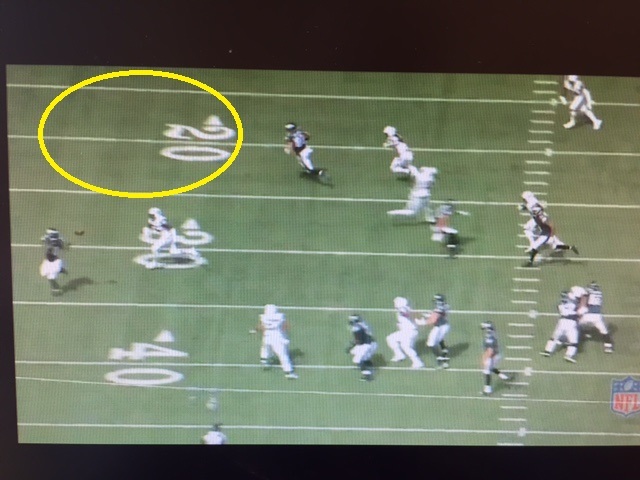 Zach Ertz is running a corner route on this play; Riley Cooper is running a drag route across the middle, and Ryan Mathews is running an out route out of the backfield towards the space vacated by Cooper. Bradford was not under pressure on this play, he simply rushed the throw to his check down option, missing the opportunity for a big play. One final example (and apologies for bringing up the bad memories here). 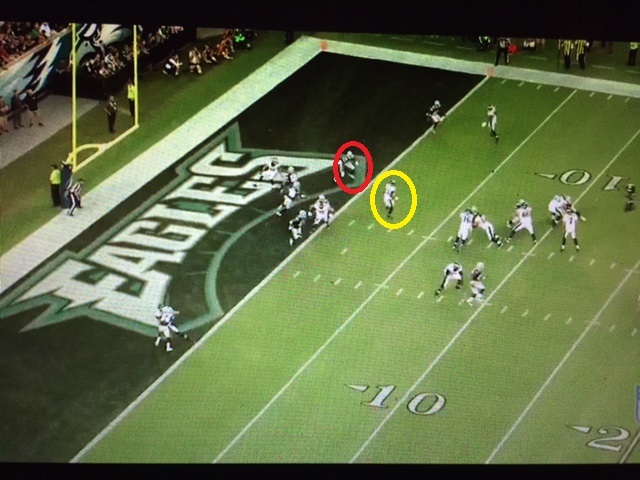 In the Dallas game, Bradford threw this costly interception when he targeted Zach Ertz in the end zone. With the exception of a minor formation change, this is the same play the Eagles successfully ran against the Green Bay Packers in the preseason where Bradford delivered a strike to the underneath crossing route for a touchdown. But here, Bradford forces the throw to Ertz, and misses Nelson Agholor (circled in yellow), who is open on the underneath crossing route. Again, there are reasons to believe that Bradford can improve here: he is only six weeks in to learning a new offense, a process which has been hampered by Bradford missing valuable time this offseason recovering from his knee injury. And Bradford showed progress getting through his progressions against the Redskins and the Saints. That should not be forgotten simply because Bradford had a bad game against the Giants. So where the hell does that leave us? As I suggested about 2,000 words ago, it leaves us with a muddled picture. That probably isn’t the popular answer in a world that demands hot takes and bold statements, but it is probably the most reasonable conclusion that can be reached. No one can dispute that Bradford has been inconsistent this year. Part of those inconsistencies can be explained by Bradford struggling to come back from a two-year layoff while simultaneously learning a new offense with new teammates. But part of these issues have persisted throughout Bradford’s career, so they likely are a sign of a fundamental issue with Bradford’s game more than rust. I still believe that talk of replacing Bradford with Mark Sanchez is wildly premature. Bradford should be given at least until after the bye before we reach any concrete conclusions on the state of our quarterback. And even then, I’m not sure that switching to Sanchez represents any discernible upgrade. Regardless, we should expect some improvement from Bradford this year, but any thoughts of Bradford being a top ten quarterback in this league seems misplaced. excellent write up! It’s definitely obvious on each and every one of those GIFs that Bradford is not transfering his weight properly. He looks damn near lacksidaisical when he throws the ball and he barely drives at all with his legs. I really wonder how much strength he has left in his legs after having to rehab his knee two years in a row. His legs look skinnier than Bambis.